Wear sunglasses and/or goggles: The sun will find you, even if it’s cloudy. High energy UV rays can make their way through the clouds, and if there’s snow on the ground, these rays can bounce off the white snow and reflect right into your eyes. This leads to glare and other vision issues that could become cataracts or macular degeneration. To prevent this, wear sunglasses – even if it’s not sunny. Make sure your eyewear have 99-100% UV-A and UV-B blockage for optimal protection. Furthermore, when you play winter sports like skiing or when you take your kids tobogganing, wear goggles with the same UV protection. 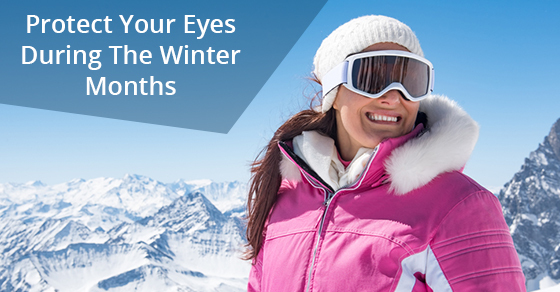 Plus, goggles will keep debris, like flying ice and snow particles, from entering your eyes. You should also wear goggles to shovel snow. Keep your eyes moist: We’re all guilty of relying on heaters or cranking the heat in the winter. However, this can make our eyes extremely dry. Your optometrist can prescribe artificial tear drops, or you may have to take an eye dryness test to determine a more rigorous course of action against dry eyes. You should use a humidifier at home to keep your eyes moisturized. You can also consider investing in portable humidifiers for the office. Besides keeping your eyes moist, humidifiers help you avoid rubbing your eyes. When our eyes are dry, we have a tendency to rub them, which can damage the outer layer. Eat a balanced diet: In the winter we tend to rely on comfort foods, but these foods aren’t doing our eyes any favours. Maintain a balanced diet that includes vegetables rich in antioxidants and beta carotene. Foods like carrots, kale and spinach are considered good for the eyes, so ensure that you are eating these a few times a week. You can actually ask your ophthalmologist what you should be eating over the winter to keep your eyes healthy. Sunscreen is a must: Sunscreen isn’t reserved for the summer. To keep the skin around your eyes from sun damage, wear sunscreen on your face and neck, especially if you’re going to be outside for long periods of time. Choose sunscreen that contains SPF 30 or more, and make sure that you apply it everywhere, particularly under your eyes. In addition, reapply as per the package instructions. If your eyes are severely dry, please contact us. We can perform an eye dryness test and create customized care solutions to ensure your eyes get back to normal.